Western Bottle News: COLOR RUN ! Thanks to ABA for the pic. 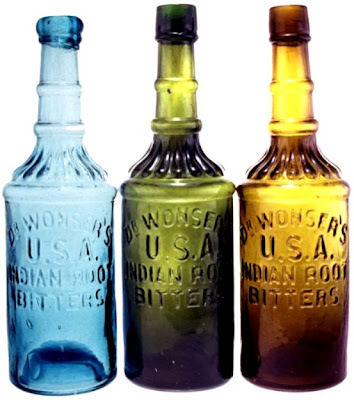 Dr. Wonser's U. S. A. Indian Root Bitters was first advertised in The Gilroy Advocate newspaper on June 25th, 1870, the advertisement ran for 3 mos in this paper. The manufactory and depot for this product was located at 645 Third St., San Francisco. Wm. Hawkins displays seven dozen of his U. S. A. Indian Root Bitters at the San Francisco Fair on September 1st, 1870. "This great remedy strikes at the root of every disease, which lies in the liver and the blood. They are not like the many poisonous compounds with which the country is flooded, under the name of Bitters, which are made of refined poison and gall, and seasoned up to suit the taste. They contain no alcohol, and their effects do not die out, but on the contrary are lasting and beneficial. For Piles, Constitpation, Chronic Coughs, Dyspepsia, Fever and Ague, Kidney, all Billious and Most Chronic Diseases". Years ago I tried to keep track of how many examples were in collections. I owned two and I was interested in knowing how many of the whiskey base moulds were out there versus the normally seen base configuration. Anyway at that time I had a count of forty, since then several have been dug, my guess for a present count would be in excess of 55 examples. Considering the number of examples of these beautiful bottles known, the continued escalation is a testament to their popularity among western collectors. The USA Indian Root Bitters has it all, a fantastic form, wonderful embossing, a large range of color, and a few lip variations. The Wonser's appeal stretches far beyond Western collector interests. They are my favorite Western bottle for their overall characteristics. Interesting that the possibility of 55 examples in collections might be considered "common". If it was a Hemi Cuda, or an LS-6 Chevelle, with hundreds known, it would still be RARE. Many objects consist of hundreds or even thousands, and are still "rare". How many Drakes Plantation bitters are out there? Thousands, and there are scores of green examples, but they are "rare". It is all subjective. 50 or less of any collectible is considered very rare in almost every field of collecting but bottles for some reason??? The reason is because of the ratio of collectors in a particular field vs. examples known. It's all relative. Now if someday there were to be as many bottle collectors as coin and car collectors, bottles with 100's known examples could become considered very rare.